With St. Patrick’s Day just around the corner, it’s never too late to acquire some green accessories to complete your outfit. 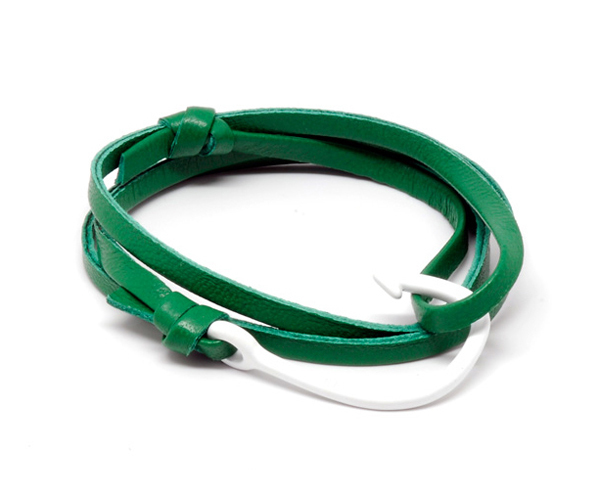 This green leather hook bracelet from Miansai is a bit more understated than say those shamrock sunglasses you bought for $10 last year, but at least you’ll be able to wear it year-round. Thanks for the link, Cole. Nice find. Loving green for spring! Question for you. I am having a darn of a time trying to find a tweed vest that I can wear any time. It seems everyone has one these days but I just can’t get a hold of one. Hey Cole. Sorry it’s taken so long to get back to you. Rugby has a really nice one out right now but they can run kind of expensive at $178. Also check out Orvis. That’s where I got mine and I love it. Do you know why they lost the logo on the hook? I recently ordered two of the hooks product, when they arrived I couldn’t find the text logo on the hook! Not sure WYL. Were they the enamel hooks or the metal ones? Perhaps the different materials allow for certain decorating options. I’ll try and find out for you. Thanks for reading!